Two American cousins, one from Berkeley, CA and one from Blue Hill, ME. initiated this website for the descendants of Donald Sage of Caithness and his grandfather, Enaes Sage, Reverend of Lochcarron — those in Scotland and those in America — to exchange information with one another: photos, memories, stories heard from their parents and grandparents, diaries, newspaper articles, family trees, etc, so that we Mackay descendants may learn about the history of our particular branch of Scottish ancestry. American cousins have delighted in the diaries and writings left by the Reverend Donald Sage Mackay's daughters — Annette, Winifred and Olivia, who described their life in New York as the children of a prominent minister, their visits to their Smith grandparents house in St. Albans, VT., their summers at the house and bungalow in Blue Hill, ME., and the time spent in Italy with their mother after their father died. Julie Mackay Pyle has saved them, cherished them and added to them for all of us to enjoy. Among other resources, dozens of stories clipped out of the New York Times were collected in scrapbooks, now moldering and tattered after one hundred years. Elizabeth Mackay Ratcliff Balderston has recently donated them to the archives of the Reformed Church in America. Many of them are included in this Website. Mr. Russell Gasero, Archivist, is preserving all of those NY Times articles covering the time that Reverend DSM served as Pastor of the Church of St. Nicholas to his tragic early death in 1908. A source for information about J. Gregory Smith, Civil War Governor of Vermont and his family. The grandchildren and great grandchildren of the two Scottish brothers, Rev. 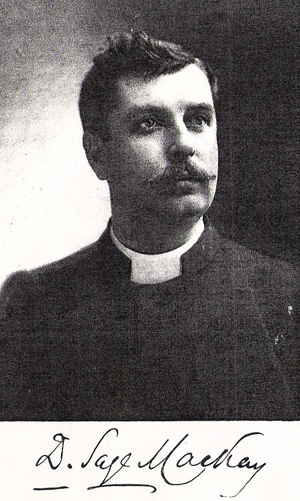 Donald Sage Mackay of St, Nicholas Reformed Church in New York City, USA and Rev. William Mackintosh Mackay of the South United Church of Aberdeen, Scotland, still exchange visits and letters. We cousins hope that this fond relationship will extend down through many generations. We hope that this site will be a meeting place where the stories of our family will be filled in and shared on both sides of the Atlantic. The Website concentrates on descendants of Aenaes Sage and Elizabeth Mackay (1700s); Donald Sage and Elizabeth MacIntosh; William Murray Mackay and Christian Sage (1800s); Donald Sage Mackay and Helen Smith, William MacIntosh Mackay and Isabella Moffat; Professor Donald Sage Mackay and Helen Thorndike, Donald Sage Mackay and Peggie McCaskie (1900s). Welcome, Mackays! Bratach Bhan Chlann Aoidh (the white banner of Mackay) Listed as our family's War Cry, it is meant to be a call for the gathering of the clan, a peaceable but still energetic folk. The latest gathering of the clan occurred in Blue Hill, ME, August, 2012 (of course there was another, organized by Julie and her children in August 2013.) Festivities were brilliantly organized by Julie Nicholson, youngest child of Annette Mackay Pyle, with the help of her daughters, Shelby, Dana, and her sea-going son. Altogether about 50 American descendants of Rev. Donald Sage Mackay attended, as well as three Scots descended from Rev. William Mackintosh Mackay: Allison Bryceland with her husband Phillip, Donald Sage Mackay and Alan Mackay, with his wife Ishbel and their son Donald. Highlights included a lobster feed on the shore, a boat trip to Long Island with our own spectacular fireworks, another evening of Scottish songs, accompanied by Alison Bryceland on guitar: A stellar performance, featuring Donald Sage Mackay, member of Parliament from Edinburgh, and Donald Sage Mackay, actor from California, singing in duet, Donald, You've Lost Your Troosers, a complete performance of Rob Roy impressively memorized and performed by Allen and Ishbel's young son Donald, daring and fun-poking family skits performed by the Levy family and a final surprise from Julie - the entrance of a Bagpiper in full regalia who played classical old songs. We rounded off this splendid reunion by holding hands in a great circle and singing For Auld Lang Syne. The Americans all shouted, "Next time in Scotland!" Donald Sage Mackay was born in Glasgow on the 20th of November, 1863, and died at the age of forty-four after a full and strenuous life. He came of a Levitical stock and would naturally have looked to the ministry as a sphere of work. His father was the Rev. William Murray Mackay of Glasgow, Scotland, a man of deep piety and great devotion to the duties of his parish. His only surviving brother is also a minister in that city. The main historic interest lies in his descent from his mother's side. The Sages were ministers in Scotland for generations. They came originally from the south of Scotland, but from the Revolution period in 1688 the Sages are identified with Ross-shire, Sutherland and Caithness. Aenaes Sage, born at Kellearnan, Ross-shire, in 1694, entered King's College, Aberdeen, Scotland in 1715, and was licensed to preach by the Presbytery of Tain in 1725. From that date onward there was an unbroken succession of Sage Ministers right down to Donald Sage Mackay. Perhaps the most famous of them was the Rev. Donald Sage, A.M., Minister of Resolis who is the author of a charming book of reminiscences called "Memorabilia Domestica", which deals with the history of the Sage family and also with local matters of great interest in Sutherland and Caithness. The account given of the "Evictions" all over Sutherland when the crofters were cleared out is particularly graphic and of value in the local history of the time.